Join us for a free live webinar. You can get up and running in less than 2 minutes! Watch the videos below for detailed step by step installation guide or simply follow the download and install instructions below. Platform Details Live Webinar – very weekday at 10:30 am Eastern time (New York). Click on the Register to Webinars on the left margin of this page. Bookmap User Guide – Open Bookmap, under the Help menu choose User Guide. Support requests received during normal support hours will be answered the same day. Off hours support requests will be answered within 1 business day. How many price levels does Bookmap updates? Bookmap presents all price levels transmitted by the exchange. When a price level goes out of the range transmitted by the exchange (e.g. CME transmits up to 10 levels of bid and 10 levels of ask), Bookmap keeps record of the last transmitted level and updates it once that level returns to the transmitted range. No delays. Bookmap is event driven, and is updated every 30 milliseconds. Most other charts aggregate and therefore incur delays. Bookmap is aimed for Pro and retail traders to help them improve their short term decisions. When you place an order you will see a circle with a line that progresses on that price level. Upon execution a triangle will appear at the end of the line pointing to the direction of your position. Click the settings icon above the chart, enable one click trading and choose your default order size per click. Middle mouse click : cancel one order from clicked price. Middle mouse click + CTRL: cancel all orders at clicked price. Observe millions of market data events, and the evolution of entire Order Book with a single glance thanks to real-time Heatmap (Bookmap = Order Book + Heatmap). 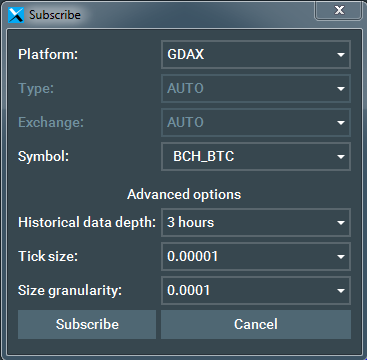 We start with GDAX, and will gradually connect more exchanges based on demand of Bookmap users like you. Please vote here for your preferred exchange. What is the advantage to upgrade to paid version of Bookmap? Login to www.bookmap.com/portal and click the Addon link on the left pane. Select the version you want to upgrade to and complete the subscription and payment. There is no need to install anything new or use a different license key. You license will be updated as soon as you complete the payment for the upgraded product. Bookmap displays sizes as integers (a number which is not a fraction). The Size granularity allows to specify the minimum size to be displayed. For instance, if the total size of a price level is 0.043 BTC, it will be displayed as 0 with Size granularity 1 or 10, as 4 with Size granularity 100, and as 43 with Size granularity 1000. Technically it’s possible, Bookmap consolidates market data from several US stocks exchanges. But prices of the same Digital Currencies pair may be very different on 2 exchanges. If you wish to suggest group of exchanges with similar balanced rates, please send us email to [email protected]. Note that you can use Bookmap’s Correlation Tracker to compare the price changes of two instruments. 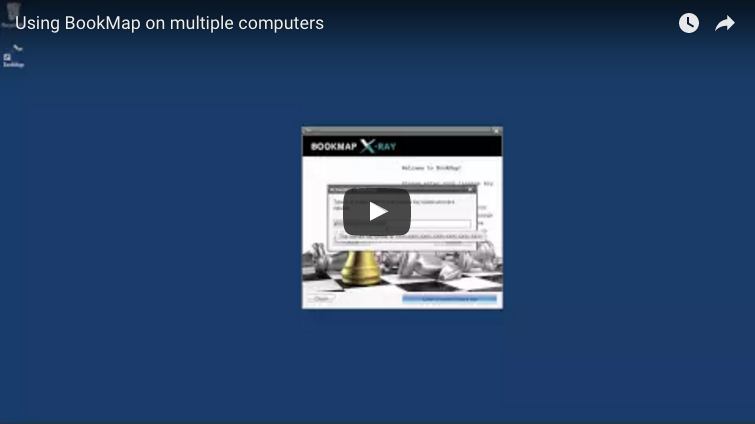 You can run Bookmap on any PC that meets the hardware requirements. However you cannot use Bookmap simultaneously on multiple PCs with the same license key unless if was intended to support multiple connections.If you have an active session on a certain PC you will be able to terminate it once you log in to a second PC.